Hang out with Bart, our two-toed sloth! Ever wonder what a sloth’s hair feels like? Or what they eat? This wild encounter is a must-do while visiting Out of Africa Wildlife Park. 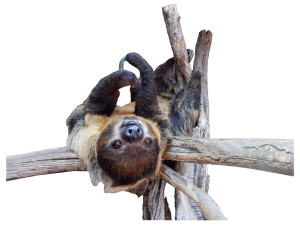 Go into the sloth enclosure and have an up-close and personal encounter with one of the most fascinating and adorable creatures of all time—the two-toed sloth. We might be a little partial, but we think Bart is the cutest one of them all. 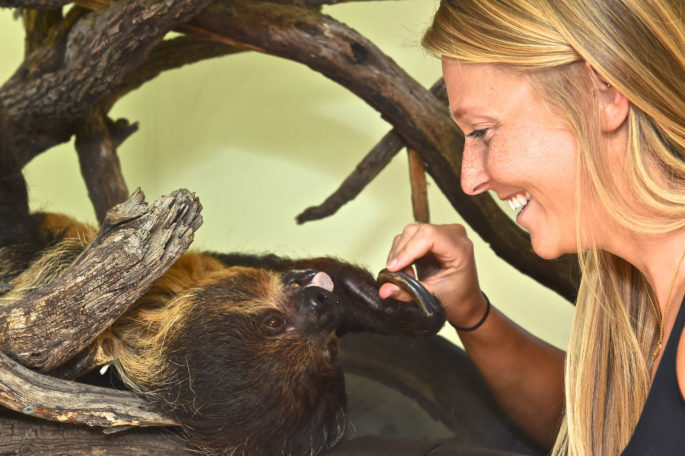 With this adventure, you’ll get to touch and feed Bart, while learning interesting facts about the two-toed sloth, like their behavior, diet, conservation efforts and more. You’ll find out just how crazy Bart is for his favorite food—tofu! Feel free to take as many pictures and selfies with Bart as you like. It doesn’t get any closer than this. Cute and captivating, you won’t be able to wipe that grin off your face after a rendezvous with Bart. Attendees of all ages welcome! Children 16 or under must be accompanied by an adult. Group size limited to 7 people. Each encounter lasts approximately 15 minutes. Book your encounter in advance: Walk-ups are possible, but these daily encounters are limited and often sell out. 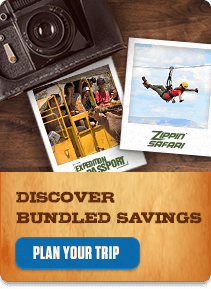 Therefore, we highly recommend booking your encounter online to reserve your spot in advance. Cost: $75 minimum for first three guests, then $15 for each additional. Maximum 7 people. The Sloth Encounter does not include admission to the park. All Sloth Encounter participants must check in at the admissions window for processing. Please arrive 45 minutes before your scheduled encounter to allow time for transportation within the park. Otherwise, you could lose your spot. This encounter requires a signed release form provided at the Park before your encounter or available for print here. We never require our animal residents to do anything they would not otherwise do in their natural environment. All encounters are dependent on animal behavior. The animals must be respected in their sanctuary. We reserve the right to end the encounter at any time for disruptive behavior. The park reserves the right to reschedule the experience due to weather. This encounter is not wheelchair accessible. If you have questions, please feel free to give us a call at 928.567.2840.